Because of Alaska's size and lack of transportation infrastructure, you most likely will be traveling in a small aircraft or boat at some point during your hunt. Aircraft and boating accidents are leading causes of hunting-related injuries and fatalities in Alaska. If you do not already possess the first aid and survival skills needed to survive an emergency for several days in the wilderness, learn and practice them before you go hunting. A great deal of aircraft safety is accomplished in selection of your air taxi operator (see transporters). In any aircraft accident, fire is a concern. Polypropylene and nylon burn or melt easily; wool does not. Choose your clothing appropriately. Remember, too, that what you have on your back and in your pockets while on the airplane may be all the survival gear you have in the aftermath of a crash. All the survival gear in the world doesn't do you any good if it's in the back of a burning or sinking airplane. Whether in a boat or a floatplane, the single greatest safety factor in Alaska waters is wearing a personal flotation device (PFD). Most Alaska waters are so cold that survival is measured in mere minutes. Even the best swimmers are quickly paralyzed by the cold water. Without a PFD to help you survive the initial shock, your chances of survival are even slimmer. Many experienced hunters using small boats carry their survival equipment ashore with them. This way, even if the boat is lost for whatever reason, survival until rescue is more likely. Every hunter should be trained in basic wilderness first aid skills and cardiopulmonary resuscitation (CPR). The first aid skills hunters and other wilderness enthusiasts need are specialized. First aid in a wilderness setting may involve difficult environments, limited equipment, and the need to provide extended care for the patient until help arrives. These special conditions can make injuries that would be handled easily in town a trip-ending or life threatening situation. One of the best ways to gain wilderness first-aid training is to participate in a Wilderness First Responder course. These courses address the challenges of administering first aid in the backcountry. Hypothermia, dehydration, and infections from cuts, burns, and blisters are common conditions that can end a hunt if not treated; frostbite can do the same. Ensuring that everyone in your party has CPR and Wilderness First Responder training is highly recommended. Other forms of basic and advanced first aid training are available from a variety of sources. The Alaska Department of Fish and Game hunter clinic series offers courses in basic wilderness first aid, as do some local businesses and universities. You can also contact the American Red Cross for available first aid training. If you live where you cannot attend a clinic or first aid course, you can purchase one of several excellent books on wilderness first aid. For example, read the compact paperback Wilderness and Travel Medicine, by Eric A. Weiss, M.D. before your trip. It is also an excellent reference that can be carried along on your trip. 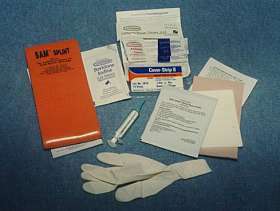 Wound management kit (left to right): SAM® splint, Povidone-iodine, Compound Benzoin Tincture U.S.P., antiseptic towlettes, wound closure strips, burn pads, (front): syringe and latex gloves. Your first aid kit should be packed in freezer-strength Zip-Lock® bags so that you can clearly and quickly see the contents. You may also want to include personal items and items needed for a particular area that you are hunting. Refer to the Plan Your Hunt Workbook (PDF 42 kB) to assist you in packing the proper first aid materials. Finally, ensure that each member of your party knows how to use contents of the first aid kit. Possibly the most important first aid skill for hunters is to be able to determine when an illness or an injury is serious enough to end the hunt and evacuate the patient. You are in a survival situation when anything happens that places your life or health, or a partner’s life or health, in danger. Falling out of a boat or raft into cold water, crashing in a bush airplane, getting lost, cutting yourself deeply with knife, axe, or chain saw, having an off-road vehicle break down miles from any road, or coming face to face with a sow grizzly and her cubs are examples of possible survival situations. Survival is the result of having enough knowledge and training to make the right decisions. Poor judgment and poor preparation are the main causes of people getting into survival situations. Acting without thinking about consequences of your action is an example of poor judgment. For example, you may want to take a sheep or goat so much that you climb a rock face that you may not be able to safely get down, much less with a pack full of sheep meat. Other examples of poor judgment include failure to wear a life jacket when boating, or continuing to walk through a dense alder thicket on a trail full of fresh bear sign. Before you go off-road, you should take the time to prepare yourself physically and mentally to survive. If you are fully prepared, the chances of finding yourself in a survival situation are greatly reduced. Too many survival materials stress long-term survival skills such as building shelters and identifying low energy food, such as edible plants. Instead, information and training on how to spend a few nights alone until help arrives is more important and will keep you from getting into a survival situation. To prepare yourself physically, get into good health and physical condition. People who become exhausted make mistakes of judgment and also physical mistakes when handling firearms, knives, and other potentially dangerous tools. Individuals in poor physical shape are less likely to survive any emergency that requires a lot of physical strength or stamina. As for preparing mentally, that means having good quality survival gear, keeping it in good working order, and practicing with the gear so you know how to use it. It also means having knowledge and skills so you will know what to do, and what not to do, when the time comes. If you have good navigational gear and practice your navigational skills, you probably will never get lost. If you practice making fires in difficult conditions, you will be able to start a fire to stay warm and comfortable. If you know how to stop severe bleeding, then you are more likely to be able to save your own life or the life of a hunting partner. Hunting in remote areas increases the importance of being self-sufficient. The farther you are from help the more serious even small injuries and accidents become, and the less you can depend on quick help or rescue. The nearest road may be well over a hundred miles away, and the terrain you must cross to get to safety may be difficult or impossible to navigate, especially if weather conditions are a factor. When you are in remote areas, it is more important to plan and equip yourself to survive. What should you do if you become lost? S-T-O-P! Sit down. Take a few minutes to relax and get control of yourself. Try to calm your fears, and do not panic. You are smart enough to think of a solution. Think. Sit down and drink some liquid and eat a snack. If you stay on your feet you will likely keep moving, which will only make your situation worse. Organize your thoughts. Relax, do not let your mind create more problems than really exist. Focus on what steps need to be taken to get out of the situation. Plan your actions. Do not react to your situation. If you have taken survival training and have a basic survival kit, you will likely be found safe and sound. The first feelings you will likely have when you become lost are panic and embarrassment. Panic and the poor decisions it causes are far more likely to end in death than being cold, hungry, or lost. If you become cold and wet, cover your head to stop heat loss, put on dry clothes, start a fire, drink hot liquids, eat foods that supply energy quickly (like candy), and never drink alcohol. 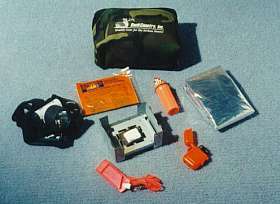 Survival kit includes (left to right): head lamp, glove warmers, strike-anywhere matches in waterproof container, space blanket, emergency stove with fuel tablet, wind proof lighter, and whistle. To stay warm, you must keep your head covered. Carry a warm stocking cap or head sock. Also carry a 4-mil-thick heavy-duty, bright colored trash bag. It will make an emergency shelter and is water- and windproof. In one corner of the bag, about eight inches from the corner, cut a hole just large enough for your eyes and nose. Put the whole bag over your body; the corner should be sitting on top of your head. To insulate yourself from the wet and/or cold ground, sit on a piece of closed cell foam. At some point you may wish to build a fire. For this, carry strike-anywhere wooden matches in a waterproof match case with a screw off cap, and also carry a metal match. Carry a pair of gloves to protect your hands. Always carry a loud whistle to signal for help. Pack a signal mirror. Be careful not to rely solely on flares or smoke bombs, since they frequently fail to work. Instead, carry two mini-mag flashlights along with your mirror. Alaska’s remoteness and vast mountains may limit the use of cell phones and/or GPS units; depend instead on a map and compass as part of your survival gear. Survival skills can be learned and practiced, even if you live in a city or town. Good sources for survival training include the basic survival training clinics offered by the Alaska Department of Fish and Game and more advanced survival training offered by companies who specialize in teaching survival skills. Contact the ADF&G Hunter Information and Training office for information on survival training in your area.